1943 Hollywood, Florida. Libert's end Naval Air Station, Ft. Lauderdale, Florida. 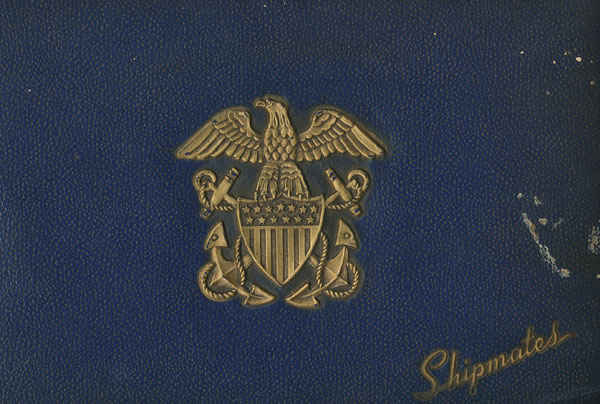 2/10/1943 Basic Navy Pier Chicago. 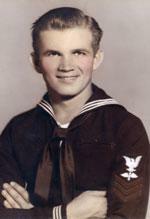 8/18/1943 Placed in San Fransico, California. 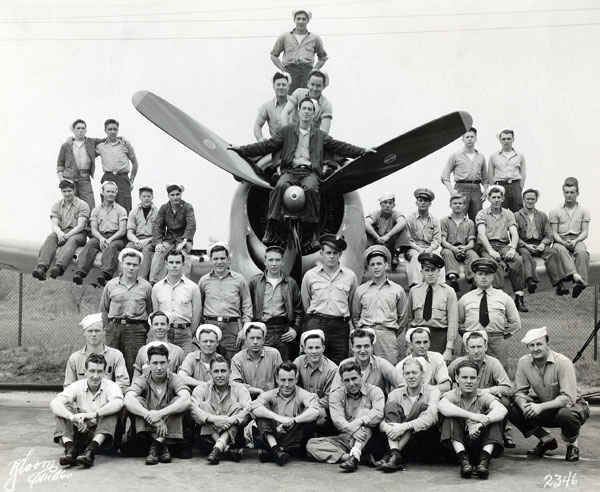 1944 The VF-17 squadron was one of the first navy squadrons to fly the Vought F4U Corsair fighter. 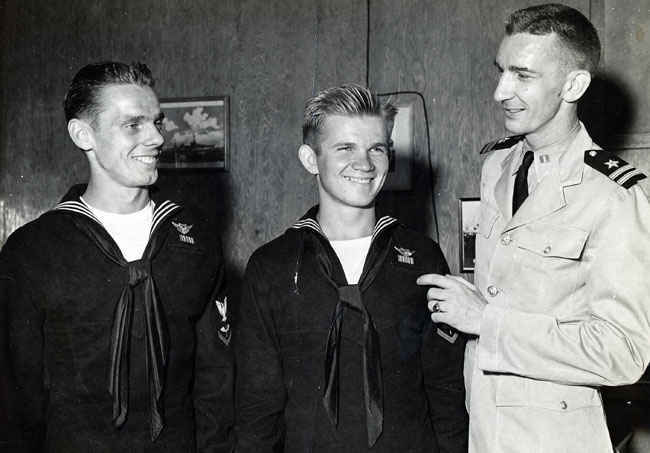 J. T. Blackburn quickly got his new squadron up to speed and they were soon deployed into combat aboard the aircraft carrier Bunker Hill (CV-17). The Navy decided to replace all Corsair squadrons on aircraft carriers with the F6F Hellcat. The reason for this move was that lack of the Corsair's carrier suitability, as it was a difficult plane to fly. The Corsair's were off-loaded from Bunker Hill and reassigned to land bases on the Solomon Islands in the Pacific. Because their plane was called Corsair after a pirate ships, VF-17's men wanted a squadron name that would correspond with that pirate theme. They came up with the famous black flag with white skull and crossbones symbol and decided on the name Jolly Rogers. The Jolly Rogers painted their new logo on the sides of the engine, not under the cockpit as tradition, so it would not clutter up the fuselage where their kill markings would later be painted. 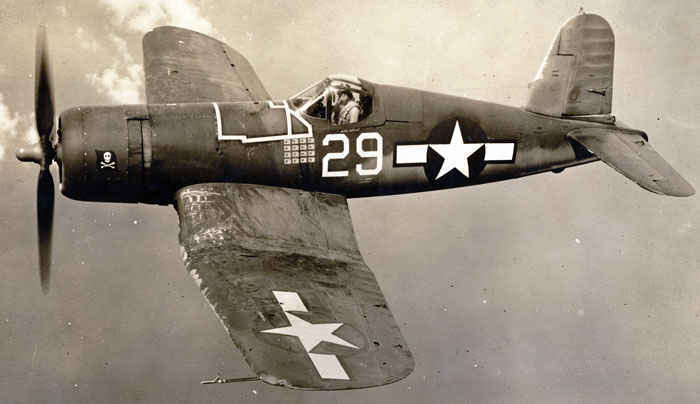 2/1/1944 Ira Kepford Corsair Ace assigned to the squadron that my grandfather worked on the planes. 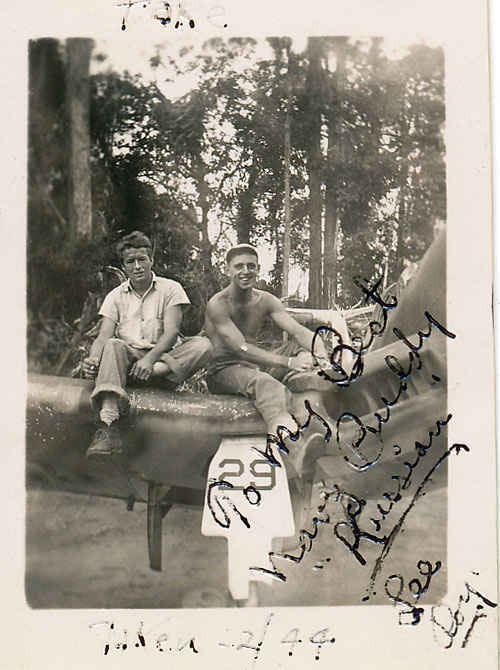 2/1/1944 In Bougainville, South Pacific. 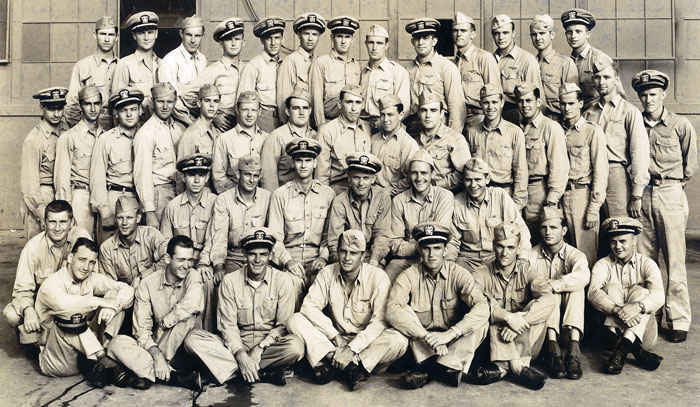 Squadron shot down 154 planes. 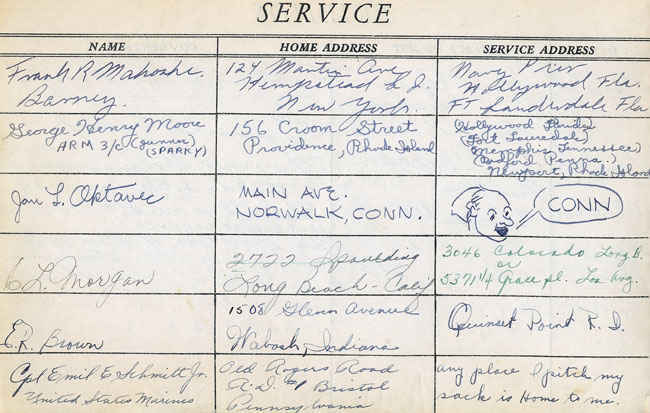 6/9/1944 My grandfather was awarded an accomodation on June 9, 1944. 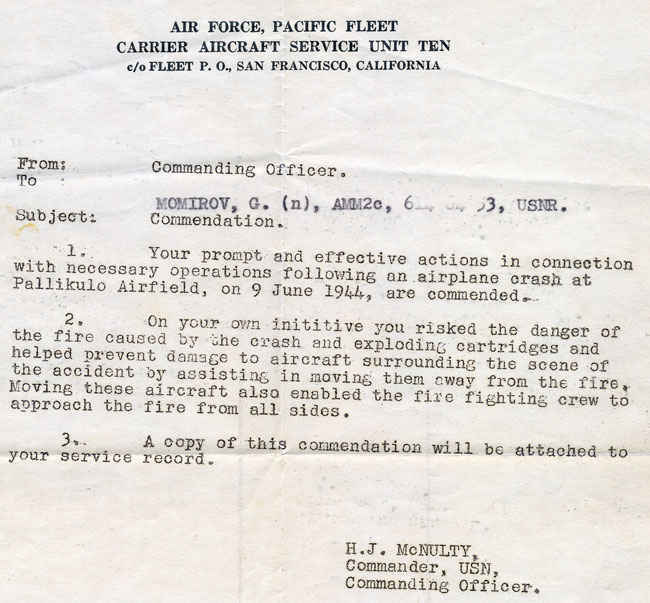 On his own initiative risked the danger of a fire caused by the crash and exploding cartridges and helped prevent damage to aircraft surrounding the scene of the accident by assisting in moving them away from the fire. Advanced South Pacific Airbase where my grandfather was stations. His squadron downed more airplanes than anyone else up to that point in time. Bougainville February 1944. From Lee Roy. 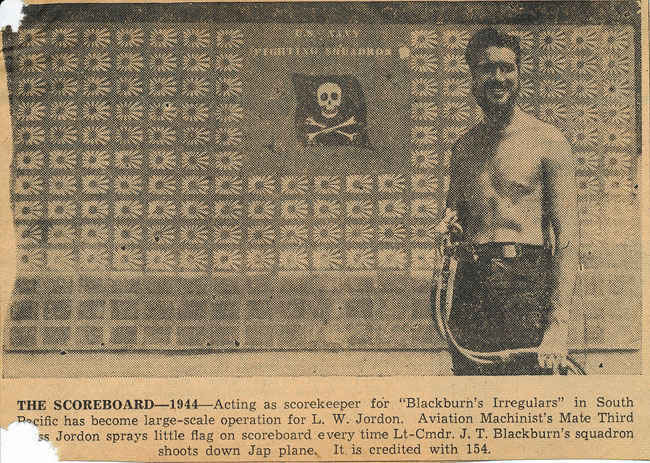 L. W. Jordon scorekeeper for "Blackburn's Irregulars" in South Pacific. Credited with 154 kills which was the top at that time during World War II. 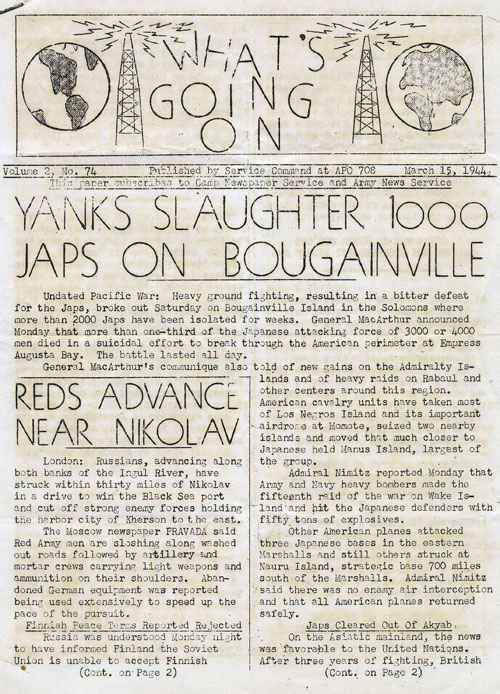 Bougainville newspaper March 15, 1944. 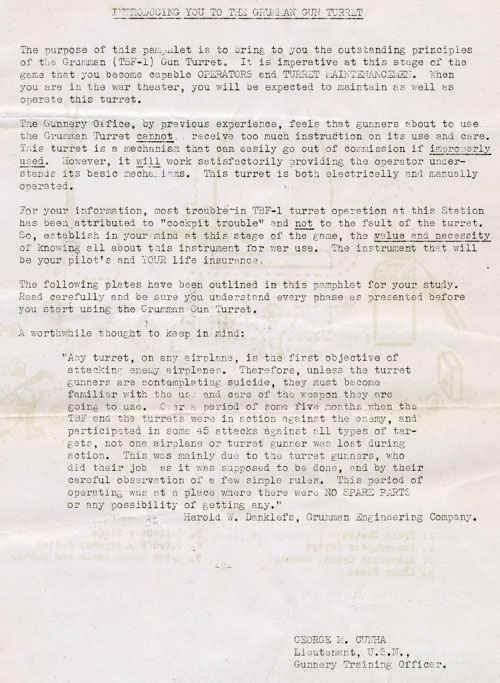 Training manual on TBF-1 Grumman gun turret. Corsair on Bougainville, South Pacific. Brother Paul to the left. 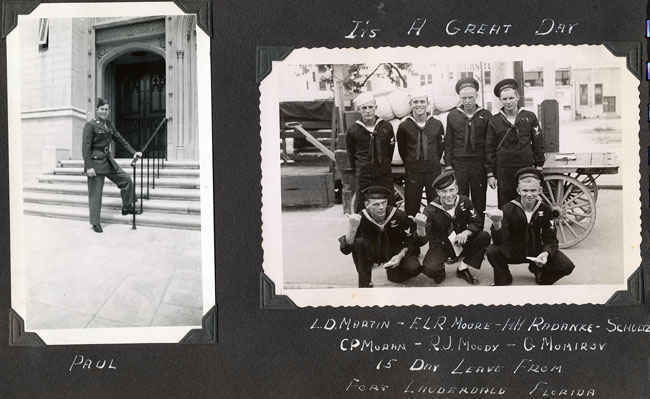 L. D. Martin, E. L. R. Moore, H. H. Radanke, Schultz, CP Moran, R. J. Moody, George Momirov. 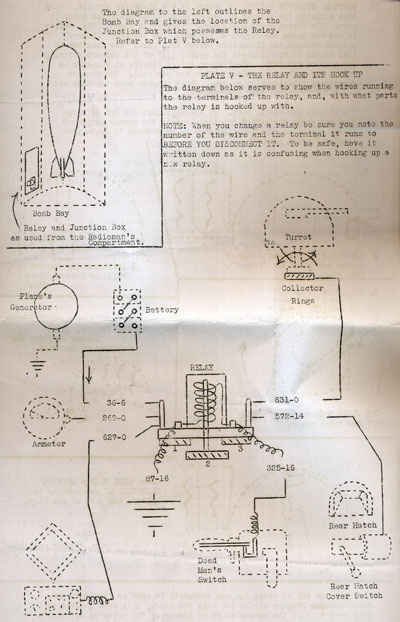 My grandfather was an aircraft mechanic and this is one of the diagrams on how to work on a plane. 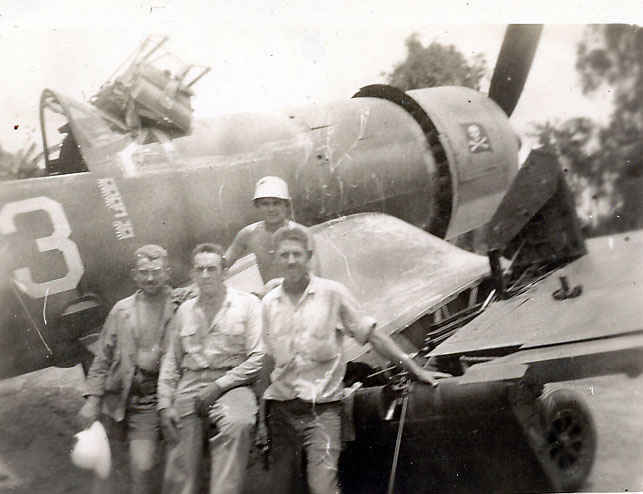 Pallikulo Airfield my grandfather help save a burning plane. June 9, 1944. Brothers. 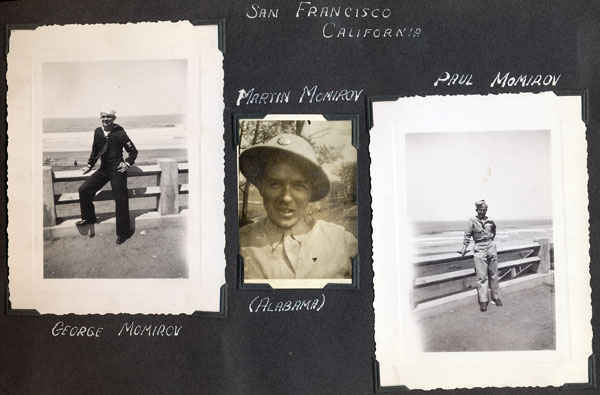 Geroge, Martin, and Paul Momirov. George in is the middle. Lt. 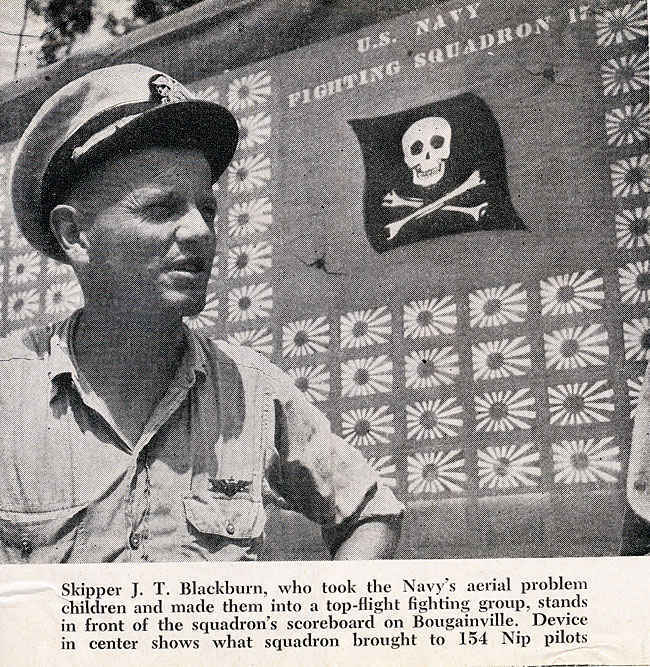 Commander J. T. Blackburn was the infamous leader of my grandfather's squadron on Bouganville. 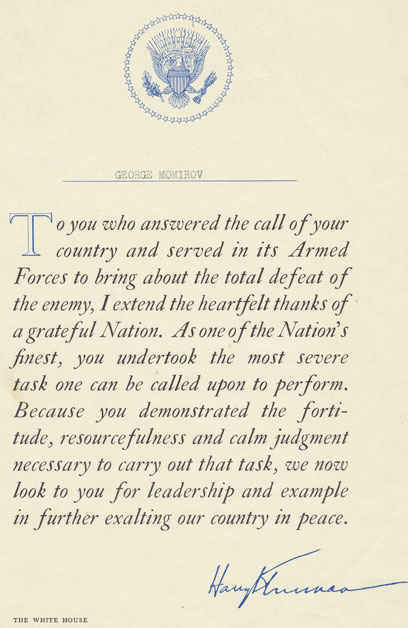 This is the letter from President Truman that every serviceman received after the war was won. 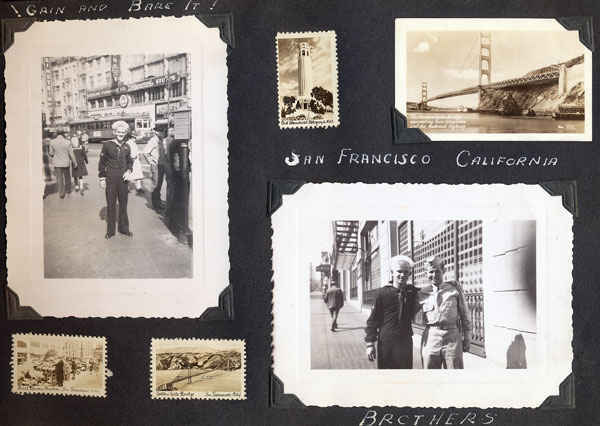 My grandfafther meeting his brother Paul in San Fransico. 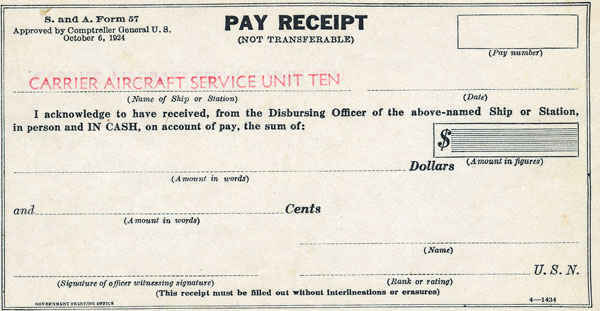 Carrier Aircraft Service Unit Ten pay receipt. August 18, 1943. 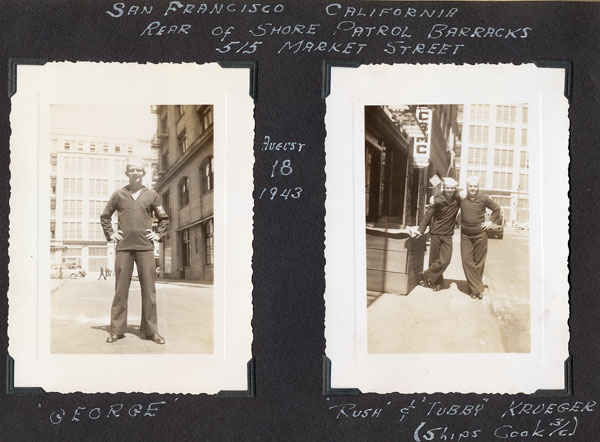 Rear of Shore Patrol Barracks George M., Rush and Tubby Krueger. 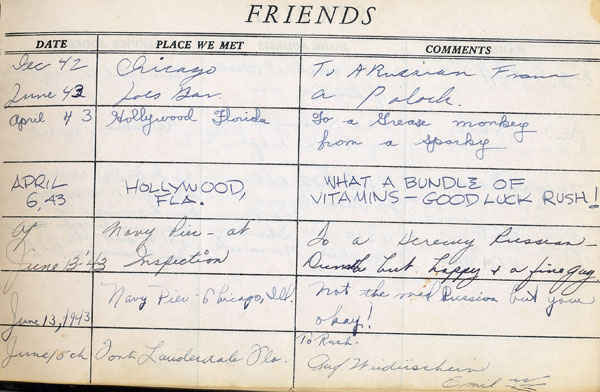 (Continued) While my grandfather first was in basic he wrote most of his friends names down. 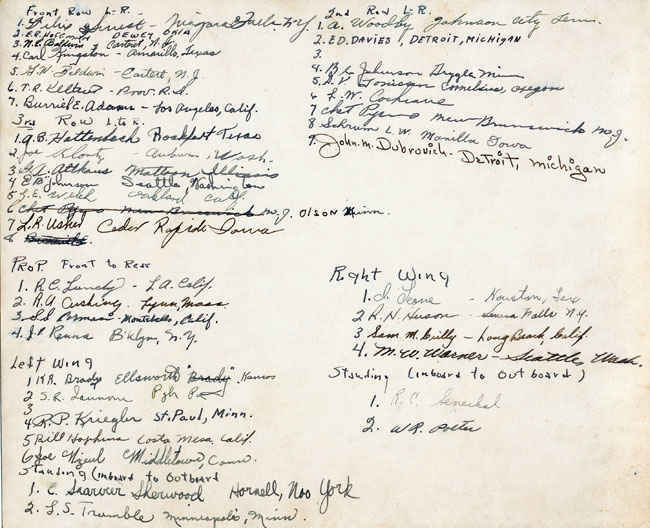 While my grandfather first was in basic he wrote most of his friends names down. F4U Corsair 1944 Skull and Corssbones Squadron VF-17 Soutth Pacfic. Ire Kepford shown in this picture was my grandfather's squadron's top ace. 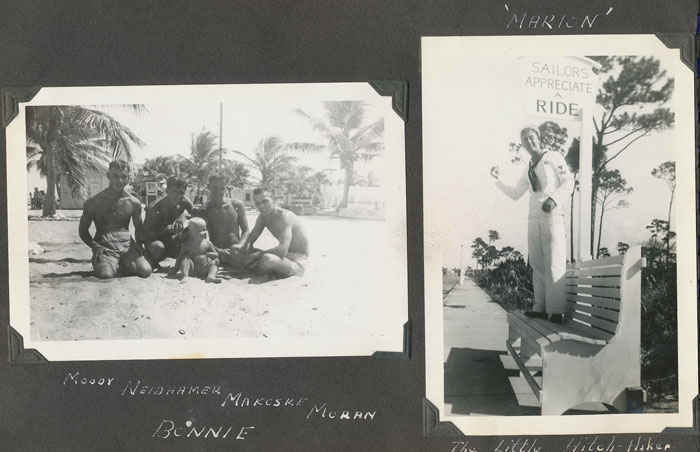 Moody, Nedhamer, Makcske, Moran and Bonnie. 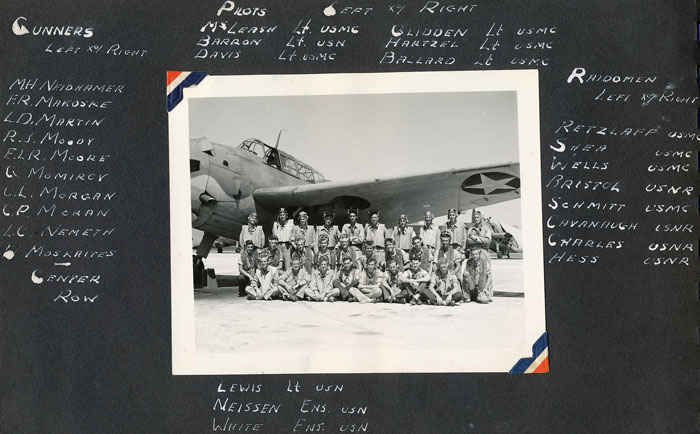 Names of the people in the TBF Avenger Squadron picture. 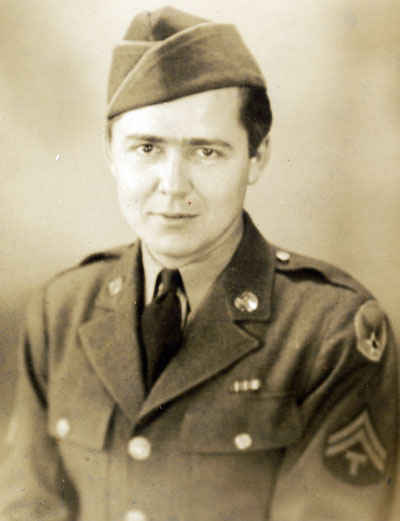 Brother Paul Momirov was in the Army. Len, Sweed, and George (2/10/1943). 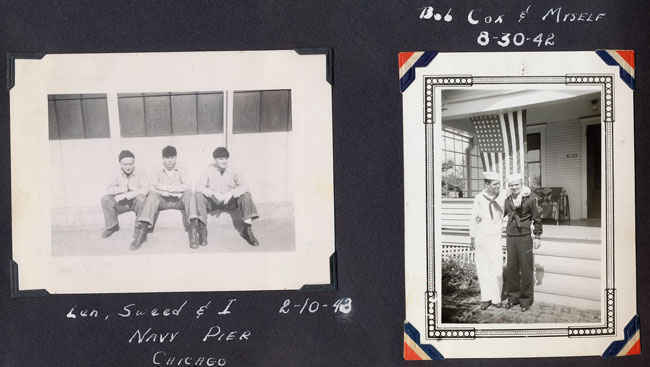 Bob Cox and George (8/30/1942). Navy Pier, Chicago. 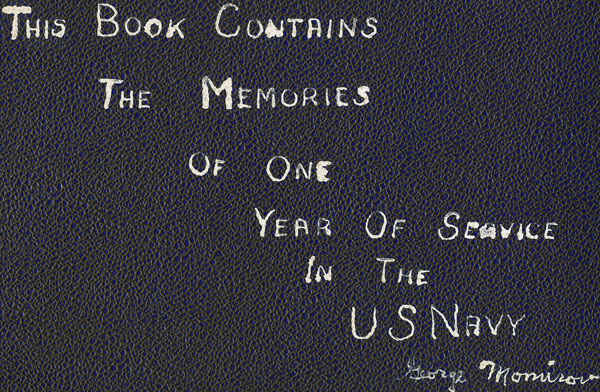 Shipmates book cover on the inside.